Recent economic unheaval in Spain has lead to a sizeable number of Spanish developers coming over to London. I find that Spanish developers have excellent web development skills, good experience with software development across the SDLC and good architectural skills. But they also come with some with some challenges, the main ones being communication skills and a mystifying education system. It is also common for Spanish developers to have a Europass CV – which is a not very helpful in the UK market. Sadly many Spanish developers come to the UK with excellent computer language skills but poor spoken English. A few employers are happy to take on a good coder (at below market average salary) but in today’s über competitive market the ability to clearly communicate with internal staleholders and the end user has never been more important. My only advice to them is to work as hard as they can upon their speaking and listening skills, ideally before they arrive. The problem for a recruiter in the London market is that Spanish CVs don’t come with a grade for the degree they acheived and I think its fair to say that knowledge of which universities are the best for computer science or software engineering is low in the UK. Its got to be said that from my research the Spanish university system appears completely different from the UK system. Much of this is because Spanish students tend, on the main, to go the university of their nearest big city, so there is not really a national “league of excellence” for higher education as Spanish universities are not ranked according to national performance in each subject. So instead we can say that the top universities are those situated in the largest city of each region. 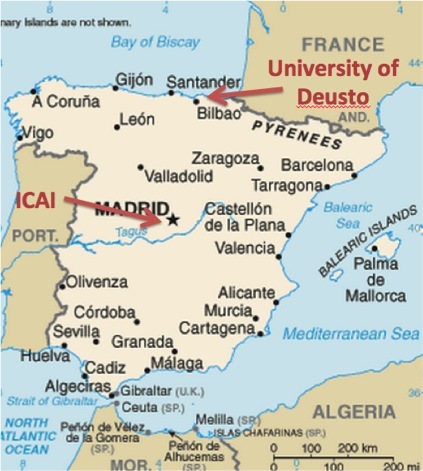 If pushed a Spaniard will tell you the two top universities for programming-based courses are Deusto in Bilbao and ICAI in Madrid. Both are private universities and – typically Spanish – both are run by Jesuits. These are prestigious institutions to attend and teach at a high technical level. In fact, although a national ranking of Spanish technical universities does not exist, El Mundo (a well respected Spanish newspaper) has compiled a list here (you will need to use Google translate if you don’t speak Spanish). As in much of Europe, Spain has two tiers of university, a public tier which will generally be “the University of” each city and a private tier. Top students tend to go to the biggest public university in their region unless there is a private university nearby that has a renowned specialism. Private universities come in two forms, the traditional, well established institutes and the newer type from the last 50 years. Many of the newer ones have a second rate reputation, and none have an entry criteria of academic excellence. When asked, most Spaniards will tell you that you do not graduate with a mark and instead as long as you attain higher than 50% then everybody graduates. However, I have found that there is a grading system. Or rather there are two grading systems, the established one and a new one introduced 2 years ago – both run concurrently. With the established system there are four grades you can graduate with, Grade 1 (for which you receive a mark of 5-7 and is equivalent to an overall achievement of 50-70%), Grade 2 ( covers 7-9 and the according percentages), Grade 3 (9-9.5) and Grade 4 (9.5-10). So you can achieve the equivalent of a first class mark in the UK, yet receive a grade which is not distinguished from the same mark as a 2:2. You can also be in the top 5% of your year/class and still receive the same grade as everyone else. So it is well worth asking what percentage your candidate received. Importantly there is actually no time limit on the length of time you study for and poorly performing undergrads can retake a course as many times as they like. So in Spain the main indicator of a “good degree” is not the grade achieved at a university with a good academic reputation but whether they attended the biggest university in their region and if they graduated within 4 years and no more. Its difficult to actually differentiate any more than this on the strength of the CV alone and I would say that unless you can see that your Spanish technologist attended Deusto or ICAI I would skip the university part of their CV and go straight to the tech testing!